A Vienna law firm administrator is wanted after he allegedly cashed a forged $250,000 check at an Atlantic City casino and then fled the country, according to police and a search warrant. Fairfax County police have issued an arrest warrant for Michael Payam Oveysi, 36, of Vienna, in the alleged scheme, which is strikingly similar to one a Vienna lawyer was convicted of carrying out in 2003. Oveysi deposited two checks worth nearly $130,000 at a TD Bank in Vienna on January 20, according to the search warrant filed in Fairfax County Circuit Court. The checks were drawn on the account of a company called the American Iranian Kurdish Community, Inc., which had less than $100 in the bank at the time, according to the search warrant. State records list Oveysi as the president of the company. On January 21, Oveysi went back to the same bank and withdrew $8,000 in cash and got a $250 cashier’s check, according to the search warrant. Later that day, he presented a digitally altered-version of the cashier’s check for $250,000 at the Borgata in Atlantic City and later cashed out for more than that amount of money, according to the search warrant. Three days later Oveysi, his wife and son boarded a flight out of the United States after presenting foreign passports with fictitious names and dates of birth, according to the search warrant. Police did not disclose the destination of the flight. Police executed a search warrant on Oveysi’s Porsche SUV and his Vienna home on Feb. 7 and carted off two computers, numerous guns and a filing cabinet among other things. Oveysi worked at the Tysons Law Group in Vienna for about a year, helping out with immigration cases, said Ron Coleman, an attorney at the firm. 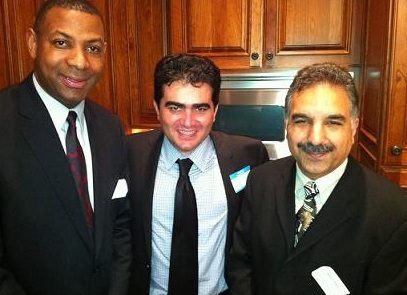 A biography of Ovesyi on a web listing for the Tysons Law Group said he is a first-generation Kurdish Iranian-American, who immigrated in his teens and attended Annadale High School. Coleman said Oveysi was hardworking and he had no indication he was in any type of trouble. Robert M. Short, a Vienna attorney, pleaded guilty to fraud charges for allegedly embezzling nearly $500,000 from his firm in 2003. In that case, Short allegedly wired $250,000 of the money to the Taj Mahal Casino in Atlantic City, cashed out and later fled to Argentina. He eventually returned to the United States and turned himself in.